EVERY step Claude Harvey takes on his seven-week "mowerthon" is a step towards a world where children won't have their innocence stolen. That's the end goal for the Bravehearts Foundation fundraising icon. 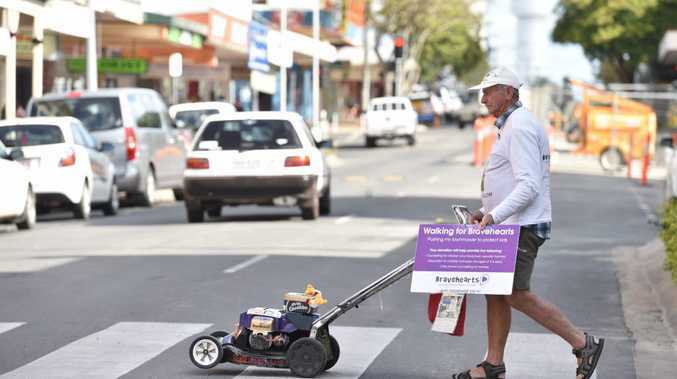 Claude has pushed his coin-collecting lawn mower through unchartered territory in his 10 years of fundraising for the child protection organisation, this time travelling from the Sunshine Coast to Bundaberg, before turning around and finishing in Moreton Bay near Brisbane. The topic of child protection is something that Mr Harvey holds close to his heart. "I knew two young girls, four and five, who were sexually assaulted by their neighbour and it absolutely ripped my heart out," Mr Harvey said. "No child deserves to have their innocence taken away from them and through education we can prevent it from happening." So far on his Bruce Highway tour, Mr Harvey has travelled more than 200km and raised $20,000 towards his $45,000 goal, which he hopes to reach before then end on his 47-day tour, taking his fundraising total for Bravehearts to more than $800,000. Claude will also reach another milestone on July 30 when he turns 70 and said he would be celebrating his birthday doing what he loved. "I'll just be pushing my mower around as usual," he said. "If you see me, come up and say hi and if you can, donate some money." Claude will be in Hervey Bay today and tomorrow, Toogoom on Sunday and Howard on Monday.